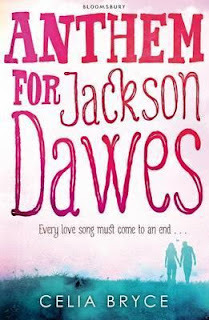 I'm not entirely sure what to make of Anthem of Jackson Dawes by Celia Bryce. I hadn't heard very much about it before I bought the book and I went into the story without any real indication of what the book would be about. 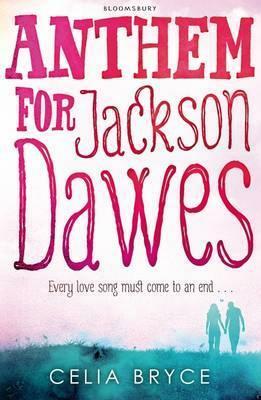 Anthem for Jackson Dawes was first out last year in hardback, and the paperback was published this month by Bloomsbury. And I think when I finished Anthem for Jackson Dawes, my overwhelming feelings were that I liked the idea of this book more than I liked the actual execution of it. Because this book is about a young girl who enters the cancer ward of a hospital and spends some time getting to know how things will work, the other children in the ward, the nurses and so on. Megan is feeling pretty crappy about her situation. She doesn't like how her cancer has disrupted her life and how she won't be able to continue doing the things she's used to, the things she enjoys doing. She's not very fond of being on the children's ward, with the cartoon elephants on the walls and not much else for her to do in order to occupy her time. The only person on the cancer ward the same sort of age as Megan is Jackson Dawes. This really larger-than-life character who bubbles over with his warmth and energy and the way in which he speaks to everyone like he or she is the only other person in the world. And through Megan's brief friendship with Jackson Dawes, she is better able to come to terms with her illness and the way in which things have changed in her life and in her relationships with those around her. I did like the story, but I felt like I always wanted more. I wanted to see a bigger development in Megan's character from the beginning to end. I wanted to see more of Jackson. I wanted the relationship between Megan and Jackson to be less brief and more memorable. While I did feel sad for Megan and Jackson and some of the other children on the ward, most notably Kipper, I didn't feel as though I knew any of them well enough. I felt very detached from the story when a child on the ward dies midway through the book because there wasn't enough time within the pages for me to overly care about that character. And that is a shame. I still enjoyed the story, especially the parts where Jackson and Megan go exploring in the hospital. I loved Jackson's determination to break the rules and to live every moment that he was able to. Jackson is definitely a character that I could see myself really falling for, I just think things were a bit too subtle for my liking. I agree that it sounds like it has such a great premise and seems to have just a great idea and flow of a story but one thing I agree in is how much a book needs to have good characters to be an enjoyable and readable experience. I think I'll probably still read this at some point but not in the near future. Thanks for the honest review! I'm glad you liked this one even if it didn't exactly blow you away. Yeah, I'm not sorry that I read it or anything I just feel like it could have had more of an emotional impact! Well, I really like stories about serious situations, cancer being one of them. this story looks wonderful but I feel like it lacks some character development.